The squad types shown here all have rules detailed in Codex Lost Souls, and instructions for conversions. To go directly to the rules or conversion instructions for a specific squad, use the links in the entries below. Hellblades rarely leave the Arenas of Commorragh, as few Lords can afford the cost of their services in battle. Their sophisticated armour and deadly weaponry makes them legendary among the few who have fought them and lived. The Hellblades were invented to make use of the current Howling Banshee miniatures. Coincidentally their rules came to resemble the Banshees also, although the Hellblades were created and tested without reference to the Banshee rules. The differences between the katana and a regular power weapon makes the Hellblades more difficult to use effectively than a standard squad, but can also lead to crushing victory in the right circumstances. Tempest squads contain the veterans of the mass-recruited Warriors. Those who survive are given close combat weapons, better than the crude splinter rifles, and are given the more prestigious task of breaking enemy lines in assault. Tempest squads were just a common sense measure - why would Dark Eldar, who naturally favour assault warfare, not equip their soldiers with close combat weapons? Naturally the changes to the basic Warrior squad makes the Tempests more useful, and hence more costly in points, but the variety in battles is worth the cost. The miniatures shown are exclusively female, but only due to my Kabal's particular nature, not for any general reason. Reapers use sophisticated rifles to capture enemies and teleport them to captivity away from the dangers of the battlefield. The duties of the Reapers offer little in the way of the pleasure of battle, but Lords are known to reward Reapers well for successful captures. The Reapers have been the most problematic squad to fine-tune the rules for, and some problems continue to be tested. Their unique weaponry gives them a unique role in battle, for they are only average against other troops, but lethal against large creatures and powerful characters. They must often be protected by other squads until they can close to weapon range of their target, when their abilities tend to come as quite a surprise to their opponents. Scourges use silent wing-jets to move quickly across the battlefield, unleashing volleys of firepower whenever they land but never remaining immobile long enough fo rthe enemy to mount a counter-attack. I had always used Scourges with splinter cannons only - the idea of rendering them immobile by arming them with dark lances seemed to be a waste of their abilities. Arming them with assault weapons, such as shredders and blasters, was a natural step for the squad. Blasters add a new dimension to the Scourges, as tank hunters, although there is little the shredders can do that splinter cannon can't do better. Executioners are found throughout Commorragh, where skill with a sniper's bullet is in high demand. Sometimes they are used in battle, when a Lord wishes to create terror among the enemy's ranks by striking down their leaders. 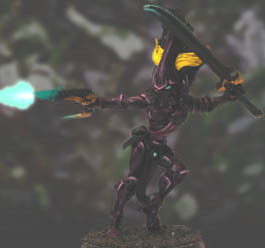 Executioners are based on Eldar Rangers, although their rifles are simpler and lack the targeting equipment used by craftworld eldar. They are one of only two squads (Maelstroms being the other) who must remain stationary on the battlefield, and are therefore a rarity among Dark Eldar. Maelstrom squads are rarely used by the agile Dark Eldar, but there are times when a Lord will demand heavy covering fire before engaging the enemy in assault. Befitting their rarity, Maelstrom warriors are awarded sophisticated targeting equipment and deadly weaponry. The Maelstroms take over a role which used to belong to some Scourges, that of sitting still and busting tanks. I always regret that the disintegrator is not more widely available in the standard Dark Eldar army, and the weapon's inclusion in this squad was to redress that. Maelstroms are not particularly useful in armies tailored to my personal tastes, but in a firepower-based Dark Eldar army they are often valuable.